haha thats awesome, I would wear those. So proud to see the ORIGINAL image! I saw a tiny thumbnail preview of this on another website, advertising crazy nails (probably from some other page, I forget). This image has gone viral and other people have put their own watermarks on it. But from seeing your channel, I don't have to second guess that this is really and truly YOUR image. Well done! Keep on making awesome nails. Too bad some people have probably already broken the terms of your creative commons license! (I've had the same problem though, haha). I'm not sure I can fully describe how awesome this is. The ears, the logo, the color contrast...It's all GREAT. Out of curiosity, how did you make the masks' little ears? Absoloutly brilliant! I am a HUGE batman fan along with my friend! 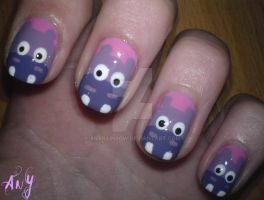 How did you shape the nails into the ears?? Cool!!!!!!!!! Make Superman or Wonderwoman nails next!!!!!!!!!!!!!!!!!! That is soooo cool! I love that! How did you do that?? Your nail art is fabulous. Love your imagination. You have mad skills. These are fantastic. How did you shape the nails like that without breaking them? You made these?!?!?!? I saw these on Pintrest, and I was like, "I have to see who made these!" and I found you!!!! Thank you! That is amazing! I would love to get that! 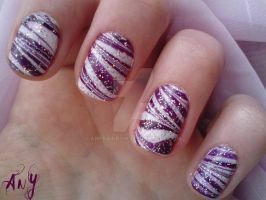 I COULD TOTALLY DO THESE! But the batman symbol might be a tad tricky... LOL Good job! Really amazing! This is awesome! Perfect shapes. Did you cut into your own nails or are they false? What do you cut them with? Sorry, I ask too many questions. Man this is awesome. I love your work! Must be hard to do.